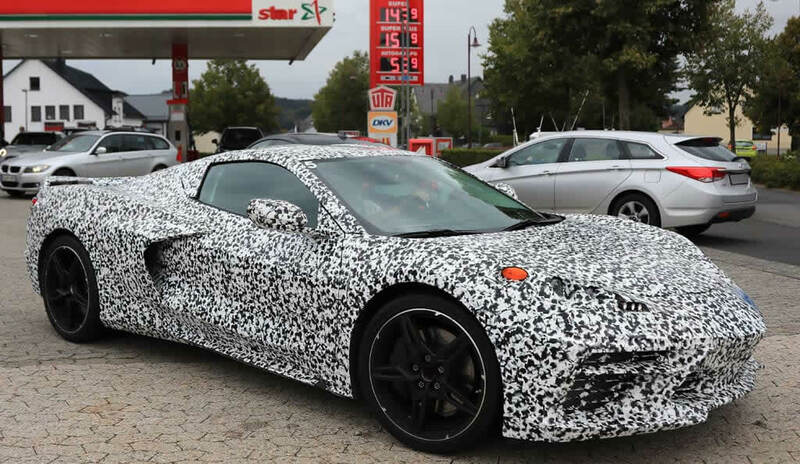 While most of us were celebrating Labor Day at cookouts and pool parties, spy photographers were busy in Europe capturing the Corvette Engineering team testing a couple mid-engine 2020 Corvettes arriving at a test facility near the Nürburging. These are some of the best photos we’ve seen to date, and they do not disappoint! Up until now, most of the spy photos we’ve seen of the mid-engine Corvette have been covered with heavy black camouflage. These mid-engine test mules were wearing much less camouflage, finally revealing better lines and details than we’ve ever seen before. The nose of the car appears to be more pointed with various design cues coming from the C7 Corvette. Around back, we see venting on each side of the rear window over the engine compartment, and at the top rear of the roof appears to be a camera which may be a rear camera mirror similar to the one used on the Cadillac CT6. As for the interior, not much can be seen from these photos as Corvette Engineers placed a covering over the dash panel under the windshield making it impossible to grab a good shot. Click on the photos below for a larger view! While the Corvette Team has been testing the road-going mid-engine Corvettes, the race car version has been undergoing its own testing as well. Captured at Road Atlanta on Wednesday, August 8th, a mid-engine Corvette C8-R was caught testing on the track. The overall shape and design is similar to the road-going car with the exception of a huge rear spoiler, and various aerodynamic bits and pieces. The side mirrors also appear to be more styled for racing as well. At the point of this writing, little is known about the Corvette C8-R that Pratt and Miller is testing, but observers have stated that the engine sounds like a twin-turbo charged V8 which wouldn’t surprise us. A couple weeks ago, GM trademarked the name “Zora” in several countries including the United States, United Kingdom, European Union, China, Japan, Korea, and Australia. Zora Arkus-Duntov was the Corvette’s first engineer and is often referred to as the Father of the Corvette. While many automotive news outlets have been quick to jump on the idea that the mid-engine Corvette will be called “Zora”, this recent trademark filing by GM doesn’t necessarily indicate this. Often times, automotive manufacturers will renew trademarks to protect their various brand assets, regardless of whether or not the trademarks refer to past or future products. On June 2nd of 2014, we reported that the name “Zora” was trademarked by GM. The automotive manufacturer could be holding on to it given the enormous historical role that Zora Duntov played in the evolution of the Corvette, or they could very well, intend on using it for the new mid-engine Corvette. Either way, it appears that the 2020 mid-engine Corvette is well on it’s way for a possible reveal to the public during the North American International Auto Show coming to Detroit, in January and a potential start of production in September of next year.